Sam Hill, the two time DH MTB World Champion, will be auctioning off on eBay his 2010 Pink/Yellow TLD Gear after the Fort William World Cup race June 7th. All benefits raised will be donated to the "The Weekend to End Breast Cancer benefiting Jewish General Hospital" in Montreal, Quebec, Canada. Sam Hill's close friend Julie Bédard at 27 years of age was diagnosed with breast cancer in 2006. 3 Months later their close friend Sophie Couture, 24 years of age was diagnosed with cancer as well. Together these two women supported each other throughout their battles with cancer, and now are trying to help others by raising awareness and funds for a cure. 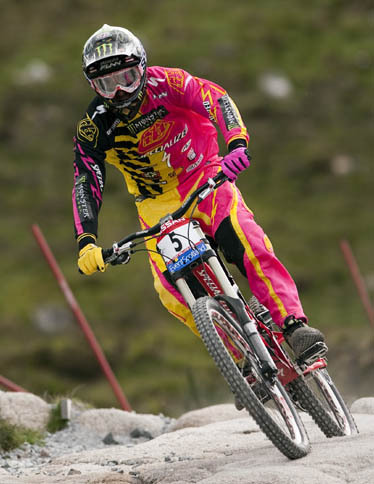 After having seen a glimpse of the 2010 TLD Pink/Yellow Gear, Sam immediately thought of tying the gear into an auction would be a great way to raise money for Julie's walk and be a perfect opportunity to raise awareness about breast cancer within the mountain biking community. Sam says; "Having 2 close friends diagnosed with cancer in one year made me aware of the need for more attention brought to fighting cancer and its research. With this being one of my first times contributing to a cause, I'm hoping I can help bring more awareness to the fight against cancer. I'd like everyone to stay strong in his or her own fight and also thank Monster Energy, Specialized and Troy Lee Designs for helping support his efforts." Julie's participating for the second year along side her mother Claire Parcel, in the "The Weekend to End Breast Cancer benefiting Jewish General Hospital" in Montreal, Quebec, Canada. During one amazing weekend, August 22-23, 2009, thousands of women and men will walk 60 kilometres in 2 days, in the fight against this breast cancer and other women's cancer. Net proceeds from The Weekend to End Breast Cancer benefit the Segal Cancer Centre at the Jewish General Hospital, an international leader in the fight against cancer and a McGill University teaching hospital. The hospital is committed to research, prevention, and treatment of breast cancer. Funds raised will be primarily directed to breast cancer research at the Jewish General Hospital, moving us a step closer to the end of the disease.